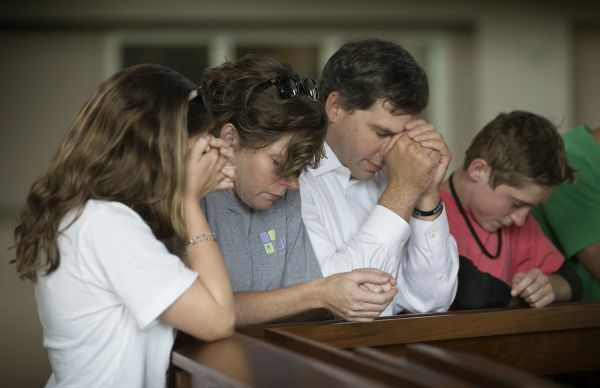 Members of the Bonn family pray during a service at Christ United Methodist Church in Franklin, Tenn., to lift up those facing the Ebola crisis in West Africa. From left are: Ashley, Debbie, Danny and Miles. Aug. 26, 2014 | FRANKLIN, Tenn.
That is Bishop Hope Morgan Ward’s video message on the North Carolina Annual (regional) Conference’s website. She echoes what many concerned United Methodists are doing in response to the deadly disease striking down so many people in West Africa. How do you look at more than 100 children and pick out three to adopt? Debbie and Danny Bonn grappled with that question. They didn’t doubt that it was part of God’s plan for them to adopt three children from Sierra Leone but how to do that was puzzling, Debbie said. “There” is the Rainy Season Orphanage in Freetown, Sierra Leone. Their oldest daughter, Ashley, took a year between high school and college to serve at Rainy Season. She introduced the family to the orphanage. God answered their prayers and “picked out” three children for the Bonn family, members of Christ United Methodist Church in Franklin, Tennessee. Their third child is a 5-year-old boy with special needs. The Bonns are sure God picked him out for them as well. The three children from Sierra Leone will join with big brothers and sisters Ashley, 20 and in her second year at college; Corey, who is a high school senior; and Miles, a seventh-grader. “It will be a huge transition, but one we have been looking forward to for some time,” Debbie said. The adoption is currently on hold because the orphanage is on lockdown due to the Ebola crisis in Sierra Leone. Before going on lockdown the orphanage had to raise $80,000 to buy enough food and other supplies for the next six to nine months. Donations can be made here. “We pray a lot on our knees,” she said again — through laughter and tears. Debbie Bonn’s family, members of Christ United Methodist Church in Franklin, Tenn., is waiting to bring home two boys, 11 and 5, and one girl, 8, from the Rainy Season orphanage in Freetown, Sierra Leone. They were hoping to have them home by Christmas, but that is delayed because the orphanage is on lockdown due to the Ebola outbreak. The Bonn family is one of thousands of United Methodists with personal relationships to people in West Africa. Camp Hill has been supporting doctors and thePanguma Hospital for several years. Panguma is about 25 miles from Kenema Government Hospital where the first Ebola patients were brought when the virus started in May. The Sierra Leone Initiative in the Susquehanna Conference is a partnership between churches in Sierra Leone and the U.S. conference. Quarantines are adding to the pain and suffering in areas without Ebola. The Rev. Richard Stryker, director of ethnic ministries for the North Alabama Conference and a native of Liberia, said communication is crucial. Texts on cell phones are sometimes the only reliable way to receive critical messages, he said. Stryker worries that the poor will not have money to spend on minutes for their phones. “They will have to decide between food or something else,” he said. The crisis hit close to home for the Rev. Wnyston Dixon and his congregation at Braden United Methodist Church in Toledo, Ohio. “Dr. Samuel Brisbane, who was medical director at JFK Hospital in Monrovia, Liberia, died from Ebola. His wife and children are members of my church. He was dedicated to serving our people, and he died doing what he pledged to do,” he said. Brisbane’s family is collecting supplies to send to Liberia. Peter Gailah, a native of Liberia and a member of Hillcrest United Methodist Church in Nashville, Tennessee, is part of an organization of Liberian natives. They are praying and sending funds, too. The United Methodist Church of the Resurrection, Leawood, Kansas, sent a $25,000 grant to the United Methodist Committee on Relief to construct isolation units for Ebola patients in Liberia. UMCOR matched that grant with another $25,000. UMCOR is taking donations through the International Disaster Relief Advance #982450 and launched an Ebola Emergency Response Plan for Sierra Leone, Guinea and Liberia. The Indiana Conference has a long-term relationship with Liberia and Sierra Leone through programs such as Operation Classroom and Sierra Leone Health Partners. Many churches and individuals have personal relationships with people in West Africa, said the Rev. Dan Gangler, director of communication. The conference is urging people to send donations to UMCOR. The Holston Conference donated over $18,000 worth of supplies to the Liberia conference, including food buckets, health and school kits and home kits for sanitizing purposes. The East Ohio Conference is partnering with MedWish to send eight pallets of gloves, masks and gowns to both Sierra Leone and Liberia. The conference is praying for protection for health care workers, family and friends of the deceased, and for people handling dead bodies. United Methodist Communications, the communications agency for the denomination, is sending out text messages using Frontline SMS to people in Liberia and Sierra Leone. “One person who dies of Ebola is one too many. Do not allow fear of Ebola to motivate bloodshed. God calls us to bring healing and hope.” — Bishop John Yambasu, Sierra Leone. “Let us use this difficult time of sorrow and grief to pray together. Be assured that God will give us hope and comfort.” — Bishop John Innis, Liberia. United Methodist Communications also sent a $10,000 grant each to Liberia and Sierra Leone to use for communicating about the virus. The Foundation for United Methodist Communications has established an emergency communications fund, and people can donate here. Bing said many of his colleagues pray every Tuesday morning for West Africa. Full coverage of The United Methodist Church's response to the Ebola crisis in West Africa can be found at www.umc.org/ebola.